in the company of wonderful friends! 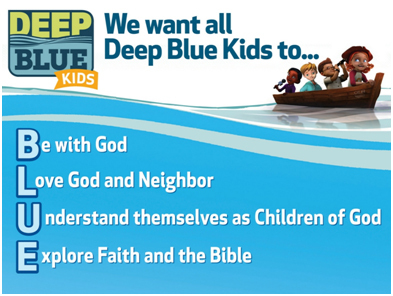 Classes for children Age 2 through Grade 5 meet Sundays, 9:45 – 10:45 a.m. We hope to see your child in DEEP BLUE Sunday school! Additional classroom teachers, helpers and substitutes are always needed! Excellent curriculum and all supplies are provided. If you are willing to serve in this way, please speak to your child’s teacher or Rev. Martha Touchton. • The Old Testament: One of the most incredible stories ever told, about who God is, God’s chosen people, what God wants for us and from us, and what it all means to our lives. • The New Testament: The story of who Jesus is, what he came to do, and how his life shapes our faith and the life of our church. • Methodist History and Doctrine: What it means to be a Christian and live as a disciple of Jesus Christ in the United Methodist tradition. “Through the Sacrament of Baptism, we are initiated into Christ’s Holy Church…. Affirm our commitment to Christ’s Holy Church.” UM Hymnal, p. 33. St. Mark’s church family is blessed to provide a wonderful ministry for children and youth with special needs called GLEE, which stands for God Loves Everyone Equally. GLEE welcomes these special children and youth into our supervised Sensory Room. The Glee Club is open Sunday mornings, 9:45 a.m. – 12:00 p.m.
We want to fully understand the needs of each person entering this ministry so our caring volunteers can be trained and available to minister to your child in the most helpful way possible. In order to do so, we ask that there are no drop-ins, but rather that a parent contact Rev. Touchton prior to your child’s first visit. In order for our church to continue responding to this need and ministering to these precious families, willing servants are needed to serve on a rotating bases during Sunday school and/or worship. If you would be willing to consider serving in this ministry, contact Rev. Touchton. Special Care for Every Occasion - St. Mark’s Nursery is open as follows: Sundays, 8:00 a.m. – 12:00 p.m.	(All Year), Wednesdays, 6:15 p.m. – 9:00 p.m. (During the School Year only). Childcare may be available for other events, such Disciple classes, walking groups, ministry team meetings, or other church activities. Please call the church office if you are in need of childcare for a specific event. Special Care for Every Age - Childcare is available for children from 3 months to 4 years of age. Infants, toddlers, and preschoolers up to age 4 may use the Nursery during 8:30 a.m. and 11:00 a.m. Sunday worship services. Infants and toddlers may use the Nursery during the Christian Education hour (9:45 - 10:45 a.m.). Children ages 2-4 will be escorted to Sunday school at 9:45 a.m..
Placement in St. Mark's Nursery and Sunday school classes follows local public school guidelines. Therefore, if your child turns 2 years of age by August 15 of the current school term, the child will attend the Age 2 class. Otherwise, the child will remain in the Toddler Nursery until Promotion Sunday the following Fall. The Nursery is open during church functions only. No child shall be left in the Nursery unless their parent or guardian remains on the premises for a church function. Operates five days per week August through May with varied programs for children 18 months - 4 years of age. Sherrie Gilliam, Director, 895-1803. 5th and 6th graders meet monthly for fun, fellowship, service and spiritual challenge, including Nashville Shores, "Created by God" seminar, Mission Mania, and Confirmation. Permission Forms for JAM events can be downloaded HERE. VBS is an action-packed adventure where we discover that life with God is full of wonder and surprise, and we can trust God to be with us through anything! In June of 2018, we’ll ride the Rolling River Rampage on a white-water rafting adventure to experience the ride of a lifetime with God! Relevant music, exciting science, creative crafts, fun recreation, memorable Bible stories and heart-felt worship help kids know that God is always with them as they ride the rapids of amazing grace! Advent and Lenten activities, Christmas Eve worship for families with children, an Easter Egg Hunt and special mission events. Camp Cedar Crest offers an outdoor experience of Christian community for rising 2nd to 6th graders. Registration in March. Children are invited to lead in worship through service in age-level Children's Choir, as an Acolyte, and as a monthly Coin Offering Usher. Each Sunday morning, all children are invited to gather at the front of the sanctuary for special story that helps them imagine and more fully comprehend the scriptural focus of the sermon. Following the Children’s Message, children ages 4 – 7 may pick up a worship bag to enjoy during the sermon; this bag is full of coloring pages, activity sheets, manipulatives and other items that help keep little hands busy while little ears tune in to the sermon.